Winners and other participants pose for camera at the award ceremony for the female participants at the final day of the 2014 WTF World Cup Taekwondo Team Championships held in Mexico's historic city of Queretaro on Ded. 7, 2014. 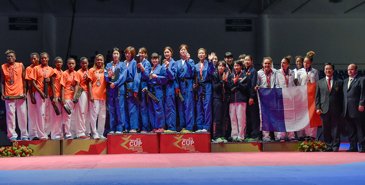 QUERETARO, Mexico (Dec. 7, 2014) - Russia won the men's team title and South Korea grabbed the women's team title on the second and final day of the 2014 WTF World Cup Taekwondo Team Championships in Mexico's historic city of Queretaro. Russian Vladislav Larin was selected as the male MVP of the championships, while the female MVP honors went to Korea's Hye-jeong Kim. Russian Stanisla Khan was named the best coach among male teams and Korean Chang-geon Lee as the best coach among female teams. Korea's Jan-bong Lee, Lebanon's Daniel Khorassandjian and the United States' Anne Gray Chase were named the best referees of the championships. Iran and Korea had to settle for the bronze medal in the men's division while China and France shared the bronze medal in the women's category. Mexico reopened the scoring early in Round Two 12-7, widening their lead - before Russia struck back with a stratospheric ax kick go the head. Then it was 11-12, 12-12 and 13-13. The Russian fighters were dominating the center of the ring while the Mexicans fought back from the edge of the mats. The pace of the fighting was now so furious, that when substitutions were made, the fighters literally charged onto the field of play and straight into the attack. At the end of the second round, the scoreboard stood at 16-16. In the women’s final, it would be the hunger of Team Cote d’Ivoire against the extensive experience and skill of Team Korea. The Koreans, in blue uniforms, faced the Cote d'Ivorians in white uniforms; both teams fielded six players. The second round slowed down but the scoring soon picked up with Korea opening up a significant lead via head kick, 13-9. Some canny moves by the Koreans pushed their score northward, 18-12, igniting some aggressive attacking play by the Cote d’Ivorians, who on two occasions literally chased the Korean girls around the ring. But the Korean team's skill and experience now began to show. They kept their head, countering consistently with their high kicks connecting for a bigger and bigger point lead. By the end of the round it was 27-14 in favor of the Korean girls, who had clearly paced the match brilliantly. Going into the third round, the Cote d’Ivorians had a lot of ground to make up but they stayed game, fighting hard. Yet the experience of the Koreans could not be denied; they raised their lead 31-15 in the opening 20 seconds. The excitement was reignited with some fast personnel changes; by now, the Cote d’Ivorians were up and charging into action as soon as their feet hit the fighting platform. But Korean skill was equal to Cote d’Ivorian challenge; the Korean girls’ timing and kick placement was close to perfect - at one point Korean even landed ax kick onto the crown of the opponent. By the last minute it was clear that only a miracle would change the result. Final score: 47-25 for Korea.